For those of us who own a tablet computer, a case is a necessity you can’t be without. Sure the iPad Smart Cover offers a clever solution for protecting the screen, but it doesn’t do anything to protect the rest of your iPad. 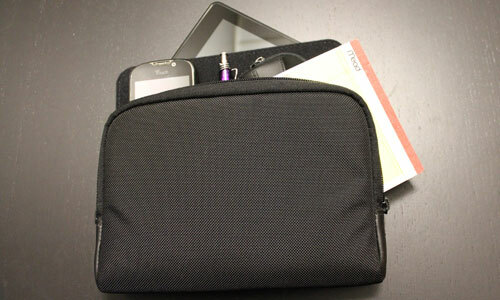 Seven inch tablets, like the Kindle Fire and the Nook Tablet need protective cases too. After trying a bunch of different cases along the way, I wound up using the CaseSmpl eReader ballistic nylon case for my Kindle Fire. The case goes beyond the simple protective cover and offers additional storage for many of the things I keep with me all the time. The iPad case offers similar protection and even more additional storage because of the size difference between the Kindle Fire and iPad. I first learned of the CaseSmpl cases in May when I was back in Iowa for a family gathering. The company is based in the Des Moines area and manufactures the cases in Chicago. One of the first things that caught my eye about the cases is a hand strap feature, which you can see in greater detail in the video below. This strap goes along way to preventing accidental drops when you are carrying the case. CaseSmpl offers two different external case designs. One is Leatherette, which is a synthetic leather material. The case material I prefer is the Ballistic Nylon, which is highly durable and seems less likely to show wear over time. This ability to bring both small devices and protect them in one case is attractive because it saves space when I travel. As I’ve mentioned in the past, I love being able to carry everything in a single bag. With the CaseSmpl eReader case, I put everything I want to have with me in my airplane seat in the case, which keeps all my other travel gear neatly packed. The same holds true of the iPad version of the case. You can fit an iPad with Smart Cover in the CaseSmpl Tablet case, along with any accessories you might need to carry with you on a regular basis. The CaseSimpl Tablet cases also hold an 11-inch MacBook Air if you prefer a small computer to a tablet, though the company also makes an Ultrabook case for thin 11-inch and 13.3-inch computers. For a better idea of what the case looks like in action, watch the video.